It was no secret that Archbishop Edward Patrick Roche, the leader of the Catholic Church in St. John’s during the referendum debates in Newfoundland in 1948 was strongly opposed to Newfoundland joining Confederation. He took every opportunity that he could to encourage “his people” to vote for Responsible Government. The anti-confederate forces were divided between the Responsible Government League [RGL] and the Economic Union Party [EUP]. The RGL advocated a simple return to the status Newfoundland had held in 1933. A group of younger anti-confederates formed the EUP, led by Chesley Crosbie, which promoted the idea of a special economic relationship with the United States. In contrast, the Confederate Association under Joey Smallwood and Gordon Bradley was better funded, better organized, and had an effective island-wide network. They campaigned hard and with considerable skill and confidence. On June 3, 1948 the results of the first referendum were released. Confederation received 64,066 votes, 41.1 percent of the total, Responsible government with 69,400 votes (44.6 percent) and Commission government was last, with 22,311 votes (14.3 percent). A second referendum was set for 22 July 1948, with Commission dropped from the ballot. Archbishop Roche was not a happy man. He looked at the results of the first referendum only to find that areas of the province that had a significant Catholic population had voted for Confederation. He was especially displeased with the people of Marystown on the Burin peninsula who had voted for Confederation with Canada. He laid the blame squarely on the shoulders of the parish priest Reverend John Fleming. 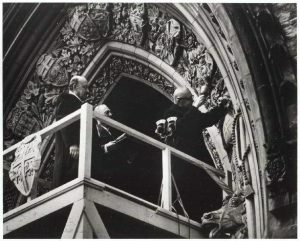 Following the 22 July 1948 the Confederation option won a small majority over the Responsible Government choice, Confederation winning by 78,323 votes or 52.34 per cent over 71,344 or 47.66 per cent over the latter. Voter turnout was 84.89 per cent of the registered electors. The Responsible Government option carried in seven districts, all on the Avalon Peninsula, and the Confederate vote carried in the remaining districts. The Confederates successfully picked up the vote previously given in the first referendum to the Commission of Government option. The same regional voting pattern evident in the first referendum was also present in the second referendum, with the Roman Catholic vote off the Avalon Peninsula having played a significant role in the Confederate vote. On March 31, 1949, Archbishop Roche would not have been in the mood to celebrate. The act creating the new Canadian province of Newfoundland (now Newfoundland and Labrador) came into force just before midnight on March 31, 1949; ceremonies marking the occasion did not take place until April 1. Recommended Reading: “Newfoundland at the Crossroads” by Dr. John FitzGerald. A guide through original documents to key issues in Newfoundland’s 20th-century constitutional history. This book reveals the desires of Britain and Canada to bring about Newfoundland’s union with Canada, and shows their close co-operation and the fascinating inner political workings of the confederation campaigns. This entry was posted in Archival Moments and tagged Archbishop Edward P. Roche, Confederation, Joey Smallwood on July 21, 2018 by Larry Dohey.